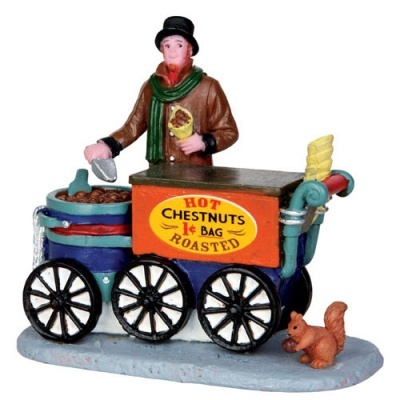 Lemax Roasted Chestnuts Figurine miniature on a single base depicts a dickensian chestnut street seller freshly roasting and bagging hot seasonal chestnuts for sale, and a cheeky squirrel benefits too! Roasted Chestnuts brings home the delightful era where Victorian street vendors were ever present. A Lemax Winter street scene addition suited for placement in a Lemax seasonal Christmas miniatures display. A popular figurine addition to the Lemax Caddington Village catalogue, joining the collection in 2004. Roasted Chestnuts is a hand painted polyresin figurine piece mounted on a single street base to compliment your seasonal Lemax Village display. Very pleased with item,very detailed. Brilliant customer service.great price,and fast delivery. Thankyou.